Today, (and every 3rd Friday in June, annually) is National Flip-Flop Day, and the perfect excuse to free your feet in time for the first day of summer on Saturday, June 21st. Gia On The Move thought the perfect footwear to celebrate would at least Feelgoodz and not leave so much of a carbon footprint. Feelgoodz is an eco-conscious footwear brand dedicated to using all-natural materials sourced and produced by communities all over the world. The reason they’re oh-so-comfortable is because they’re made incorporating more natural rubber than any other brand on the market. (They’ve also got a shopping honor system). They’re eco-friendly, sustainable and 100% vegan. The use of the word flip-flop for thong sandals is a modern term dating from the 1960’s that describes what is probably the oldest form of footwear still being worn (the term flip flap has been used in various echoic senses since 1529). Flip flops have been around for at least six thousand years. As a point of comparison, primitive shoes are shown in rock paintings dating from the late Paleolithic (Stone Age) period some 15,000 years ago. There are depictions of flip flops in ancient Egyptian murals on tombs and temples from about 4,000 B.C. The oldest surviving examples of thongs were made from papyrus leaves circa 1,500 B.C., which are on display in the British Museum. 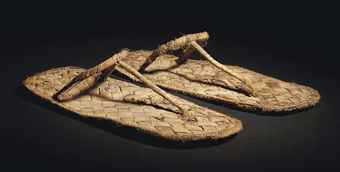 Early flip flops were made from a multitude of materials. Ancient Egyptian sandals were made from papyrus and palm leaves; rawhide was used by the Masai in Africa; wooden sandals were made in India; rice straw was used in China and Japan; the leaves of the sisal plant provided twine for sandals in South America; and the indigenous populations of Mexico used the yucca plant. Styles too varied with the differing placement of the toe strap, as subsequent civilizations preferred using different toes. The Greeks for example made use of the big toe; the Romans, the second toe; and the Mesapotanians, the third toe. These distinctive, physical entities were recognised and captured in Egyptian statues, and this was thought to represent the celebration of other cultures. Legend has it that courtesans in ancient Rome arranged the nails on the soles of their thongs to spell out follow me in the dust of the street. The Nihon fuuzokushi jiten (Encyclopedia of the History of Japanese Manners and Customs) reports the wide use of zori (a form of flip flop with a thong held between the toes) in Japan from at least the Heian period (794-1185). Japanese children have traditionally worn them when learning to walk. Given their long history, flip flops up to now have changed relatively little from ancient times. Photo (above) provided by feelgoodz Instagram.